Obi: Side wrap orange obi not to be confused with the slightly darker orange used for the second series of Elvis albums that completed the series. Cover:This iconic cover is one of the most stylistically copied cover designs ever conceived. 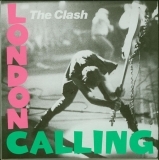 One of the more famous homages done is the cover of The Clash's London Calling. 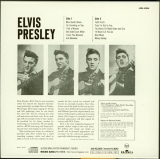 Inserts (additional):Inner sleeve contains small images of other releases in the Elvis series. The first rock n' roll album ever to reach no. 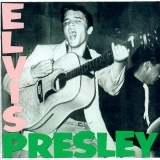 1, achieved in March 1956, Elvis Presley includes "Blue Suede Shoes" and "Blue Moon". Everything about this album from it’s record shattering rock n’ roll music to it’s unforgettable album cover has reached beyond groundbreaking and into the lofty heights of being considered iconic. 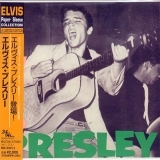 Nevertheless, do not despair especially if you are a manic collector because all the non-included, bonus cuts are found on other CDs from this Paper Sleeve Collection series (For LP Fans Only, Elvis’ Golden Records). Further, although all the songs Elvis Presley does contain are also available on lots of other discs, if you must have the record that started the revolution, this is it. Additional comments and images: blatker Sep-28-2006. 2009-11-05 - Reprint (2005-08-16) recorded by robot harry (source CDJapan).